This door is made with the same "sandwich" method as is used for the half glass door with panels. This method of building a door means you can use flat strips of wood and do not need to rout a channel for the 'glass' window or use special U channel mouldings. The door shown in these instructions is made in three layers which works to hold the plastic used for door glass, securely in the door. This method works for all kinds of styles of model doors, including garage doors. The trick to using this method is to frame your plastic window with wood which is the same thickness as the plastic. The frame is then overlayed with wood which is slightly wider, covering the edges of the window and holding it securely in the door. I've made the door shown here in 1:12 scale. You can adjust the measurements for wider doors, doors with wider trim, or doors in a different model or dolls house scale. I used a miter box and razor saw to cut the pieces for this door, except for the window plastic which was scored with a heavy craft knife against a metal ruler. A sanding block (160 grit sandpaper) was used to final sand the wood pieces. I used a magnetic gluing jig to hold the parts while the glue dried, but you can use other clamps, books or boxes of baking supplies if you don't have a clamping system. A pin vise or mini drill and wire cutters are needed to drill holes for the dressmaking pins used for the hinge, and to cut those pins to the correct size. 3/16 x 1/16 inch thick basswood for the inner door frame around the window 'glass'. 1/16 inch thick 'lexan' plastic for the door and transom window. 1/8 inch square basswood stock for the transom window frame and the transom muntins. The trick with choosing materials is to use a wood the same thickness as the plastic for the window to frame the window, then use a slightly wider strip of wood to hold the window in place by making a lip around the window edge. I based the size of my door on commercial dolls house doors which are usually designed for door surrounds which are 3/8 inch thick. If the wall you want to insert your door in is thicker or narrower, you will need to adjust your materials. The door itself is roughly 3/16 inch wide, allowing you to set it flush with one side of the door surround, or set it back from the front or back sides to leave a 'reveal'. As built, this door will swing in either direction. It can be easily prevented from swinging in or out by adding a strip of wood to the door frame to act as a door block. This can be added across the base of the door frame, or along the frame behind the opening door edge. To begin building your shop door, determine how wide you want your door, and how wide a frame you want around the door. This will determine the size of the glass for the interior of your door frame. I cut my plastic sheet to a window size of 5 3/8 inches by 2 3/16 inches. This gives me a final door size of 6 1/2 by 2 1/2 inches using the strip wood listed above (including my trim but not the door frame and transom). With a one inch transom window above the door the total door including transom and frame has outside measurements of 7 7/8 inches by 2 7/8 inches. One eigth inch of the hight of the door in its frame (the 1/8 inch base) will be recessed into the floor when the floor for the shop I am building is finished. Begin by cutting your window plastic to the size you need. Build a frame for your window as shown in the photo, setting the door edges so they will run the entire length of the door, with cross member at the base and top of the door and a further cross member below the glazing to hold it in place. Take care to cut all your wood pieces square, using a Mitre Box and saw. Use a square sanding block, made from a square scrap of wood covered with sandpaper, to sand the ends of your wood smooth and square after you cut them. Test fit all your inner frame pieces, then glue them together with a quality pva glue or carpenter's glue, clamping them together with string, clamps or a magnetic gluing jig as shown here. Remove any excess glue with a damp cloth. Leave the protective coating on your plastic window as long as possible during the building process. When the inner frame holding your door window is completely dry, Cut the pieces of trim wood which will overlap the door. All the outer edges of your trim pieces should line up square with the outer edges of the door frame you built in the previous step. It is easiest to measure and cut the two narrow outer frame pieces and glue them to the wood of the frame beneath, then cut the wood for the base of the door and check the fit between the outer edges. Finally cut cross piece for the top of the door. Glue the pieces securely to the wood on the center layer, but do not glue them to the plastic window! Apply the glue to the wood in the center section when you glue up this face of the door, don't apply the glue to the pieces you have cut for the upper section. Press the pieces against the center layer and weight or clamp them in place. Leave to dry securely before finishing the other side of the door. Turn the frame of your door over and cut the pieces for the final side of your shop door the same way you cut the pieces for the previous step. Remove the protective covering from your plastic window and glue the final strips of wood to the center layer, applying glue to the wood in the center layer, and taking care to line up all the edges of the door layers so the outer edges are flush with one another. Press the wood strips in place firmly and weight them down or clamp them until the glue has dried. All the framing pieces for the Dollhouse Shop Door are cut from 1/8 inch thick material, 3/8 inches wide. If you are building the door frame with a transom window you will need two uprights, and three cross members to fit between the uprights. If you do not want a window above the door, you will only need two cross members. The size of your pieces will depend on how large a transom window you want above your door, and how wide you built your door. See the next step for measuring the door pieces to fit, allowing a slight ease for the opening door. To make measuring easier, determine the size of transom window you want (cut it to fit the opening, the actual view of the window will be smaller because you will hold the window in place with square trim, I used 1/8 inch square stock all around the window and a 1 inch by 2 5/8 inch window. With the shop door completed it is time to build the frame that will hold it in the wall of your building. I'm going to use the standard method of hinging model doors, using dressmakers pins as hinge pins which are held through the frame at the base and top of the door. For this method you need a slight gap above and below the edges of the door. If you are building this door to 1:12 scale, you can use the outer measurements of the frame (7 7/8 inches) to cut the two frame uprights from 3/8 inch by 1/8 inch basswood (lime) strips. You can adust these measurements to make a smaller or larger transom window, (or to leave the transom out entirely). To ensure the door will fit the frame correctly, I lay out the side supports once I have decided how large a transom window I want (I used a one inch wide strip of plastic for my window in this case). Notice how I have 'shimmed' the door opening edge using a metal ruler as a spacer to hold the door frame piece slightly away from the door, this will give me a bit of a gap to allow the door to swing freely when it is assembled. 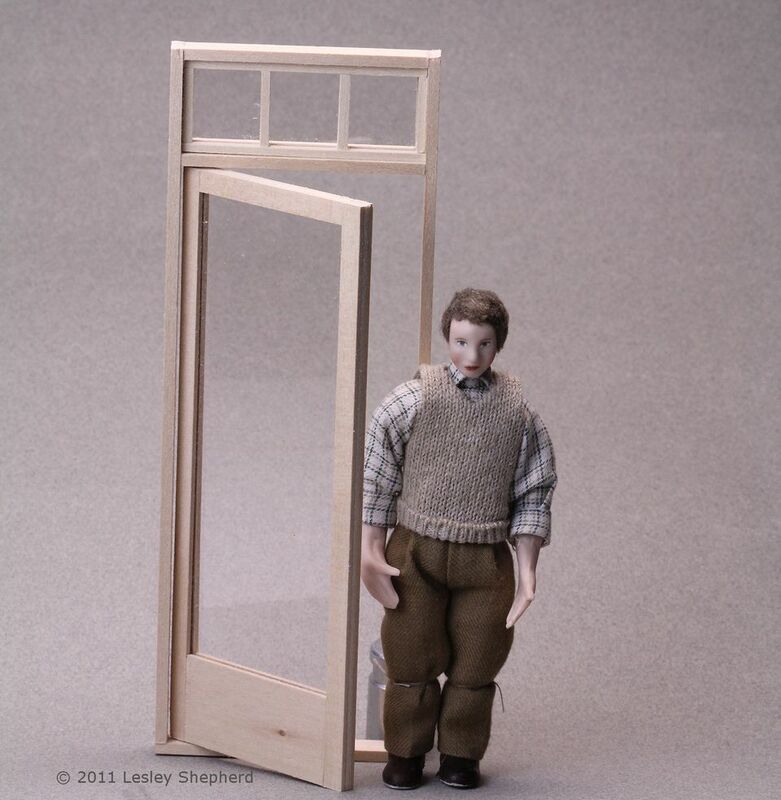 For a 1:12 scale door, you should leave roughly 1/16 inch as a gap, dividing it equally between both sides when you go to position the door (to assemble the frame. To ensure the door doesn't stick against the base plate once it is hinged, I also used a thin shim between the top of the door and the cross member which will hold the hinge pin for the top of the door. Cut your pieces to fit your door as shown, and glue the frame together, except for the cross member at the top of the door, which you leave free to glue after the hinge is positioned. Test fit all the pieces, then glue the frame (except for the cross member above the door) clamping the pieces securely in place. Leave to dry. The next stage in assembling the dolls house shop door is to round the edge of the door on the opening side with fine sandpaper and a sanding block. Rounding the edge of the door by taking off the square corners will allow the door to open. You don't need to take very much off, just round off the outer corners of the door. With the door edge rounded, set the door into the frame you made in the previous step, using a piece of paper or card to shim the door evenly on both sides. Decide where in the frame you want the door positioned. I set mine to be at the back of the frame, so there will be a slight inset of the door inside its frame. This will affect how widely your door swings open, so if you want your door to open completely, set it flush with the edge of the door frame on the opening side. If the door is going to be flush with one side or the other of the frame, lay it in place with the door on a flat surface and the frame around it. If your door needs to be inset from both sides, use card or thin craft wood strips to hold the door up from the work surface in the frame by the amount you want to inset the door. When you have the door correctly positioned, use a mini drill (pin vice) and a drill bit which is the same diameter as your dressmaker's pins, to drill up through the bottom of the door frame into the center of the rounded edge of the door. Make sure you have your door and frame clamped to your work surface, and your drill square to the edge of the door. You don't want to drill through your door because your drill or your door or frame weren't positioned correctly. When you have the hole drilled through the bottom of the frame into the door, take the trim which will fit above the door and drill a similar hole down through the trim and into the door as shown in the photo above. With the holes drilled in the door frame and door for your hinge pins, measure a dressmakers pin against the length of your drill, which will give you the length of the hole you drilled. Cut the pin slightly longer than the length of your drill bit. Fit the hinge pin into the door for the cross member which goes above the door, and set that cross member into the frame. Glue it into position slightly above the door, so the door swings freely and has a small space at the base and the top (enough gap for a sheet of paper). Set the hinge pin into the bottom of the door through the bottom of the frame. Press the pins into the door, the extra bit of length you gave them should help hold them in the wood while you finish your door. Check that the plastic you cut for your transom will fit into the door with the hinges in place. With the hinge pins in place, set your plastic transom window into the space above the door. This window will be held in place with a 'frame' of 1/8 inch square stock which is glued to the door frame all around the transom window on both sides of the window. You can choose to set the transom window slightly back of the door frame for a more traditional look, or make the window framing flush with the door frame for a more contemporary look. In the example shown here. I set the transom window in the center of the door frame, setting my framing pieces 1/16 inch back from the front and back edges of the door frame, tight up against the window. It is easiest if you set the cross framing pieces on one side, then on the other side, then set the side framing pieces in place. Adding Muntins - Many traditional shop doors have transoms which are divided by uprights called 'muntins'. If you want to add muntins to your door it is easiest to do this only on the outside frame of your window so that you can clean the glass easily on the inside. When all the pieces of your door are finished, you can install your door in a cutout for the door on a shop front or dollhouse roombox. The edges of the door can be covered with your choice of moulding trims to cover any gaps between your wall and the door surround.